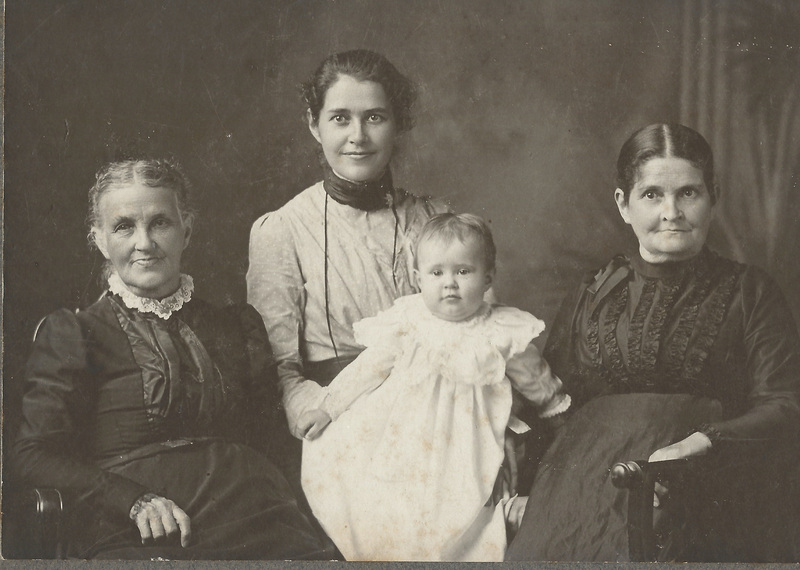 Agnes and the children moved in with her widowed mother, Fanny, in South Salem, Ohio. Fanny’s father, Agnes’ grandfather, Rev. Robert G. Wilson, had died earlier that spring, on April 30, 1851, but Fanny’s sister, Agnes’ aunt Mary Irwin, lived next door with her three children (Robert, 13, Mary, eight, and Joseph, aged two). Mary was also a widow. Her husband, Joseph Irwin, died in 1849. Fanny herself still had three children at home, James was 17; Mary was 14 and Martha was 11. Agnes’ own children included Mary Frances, who was eight years old, Will, who was six, Sarah, aged two and one-half, and four-month-old baby Ann. Agnes settled in and the three widows and their children carried on as best they could. Fanny took in boarders from the local seminary as her income; it isn’t clear how Agnes was to provide support for her own family. It is hard to imagine that tragedy would once again strike but less than a year after Agnes and the children arrived in Ohio, little Ann succumbed to illness and died at the age of 14 months on July 18, 1852. Agnes now had to bury another of her children only a year after losing her husband. 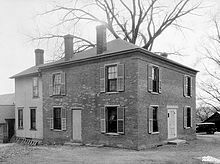 At around that same time, Agnes’ half-sister, Mary Margaret McDill, married William M. Pinkerton and settled in Bloomingburg, Fayette County, Ohio, just a few miles northwest of South Salem. Then, on May 19, 1853, Agnes’ mother Fanny, now 49 years old, married Mary Margaret’s new father-in-law, William Carson Pinkerton, and she also moved to Bloomingburg. Agnes still had her aunt Mary in South Salem, and it is possible that Fanny had invited Agnes to remain in her home and use the income from the students who had boarded with her, but Agnes had to be concerned about her own future. She was now 27 years old and she had to find a way to support her children. That same spring, in May of 1854, Rev. Gideon Pond, a widower whose story has been recorded in these pages through the lives of his first wife, Sarah Poage Pond, and of his sister-in-laws, Margaret Poage Williamson, and Cordelia Eggleston Pond, represented the Presbytery of St. Paul, Minnesota, at the Presbyterian Church General Assembly in Buffalo, New York. Agnes was 28 years old when she and Gideon Pond, then 43, were married in Ohio on April 20, 1854. Agnes and Gideon Pond were married on April 20, 1854, in Ohio. I’ve tried to calculate how well Gideon and Agnes knew each other prior to this commitment. Undoubtedly their paths crossed occasionally over the years while Robert Hopkins was alive but when Agnes and Robert first came to Lac qui Parle in 1843, Gideon and his first wife, Sarah Poage Pond, were already living at Oak Grove in what is now Bloomington, Minnesota. Gideon would have had very little reason to visit Traverse des Sioux during Robert and Agnes’ years there and I truly cannot document any type of personal acquaintance they may have had. Still, it is clear that both of them needed someone. Jane Williamson wrote to her cousin Elizabeth of Sarah’s passing and Gideon’s dilemma when his wife Sarah died on May 2, 1853. Gideon had every right to be concerned about his children. Ruth age 15, was living with Gideon’s sister and her family in Connecticut when Sarah died. Edward, 13; Sarah, 11; George 10; Mary Ann, 7; Jane, 5; and three-year-old Ellen were at home. Sarah was too young to care for her siblings and take care of the house, and although Ruth returned to the family soon after Sarah’s death, she was also too young to manage such a large household. For Agnes, Gideon provided not only a somewhat secure future for her and her children, but his proposition allowed her to continue her path toward becoming “one of God’s people,” as she had so passionately desired when she was a young girl of 14. The only difference now was that, instead of laboring at a mission specifically for the Dakota people, she would be the wife of a pastor of a Presbyterian Church in the growing community of Bloomington, Minnesota. Oak Grove Presbyterian Church had been founded by Gideon Pond when he and his brother Samuel had decided to not follow the Dakota to the reservations and continue their work as missionaries in 1851. Neither of them believed that the reservation system would benefit the Dakota and they became pastors to congregations more specifically established for the white settlers who were pouring into Minnesota. Gideon was the founding pastor of Oak Grove Presbyterian Church on September 19, 1855. The church was originally located in what is now Bloomington Cemetery at 104th and Lyndale. It was moved (by two horses and four oxen) to the congregation’s present location at Old Shakopee Road and Penn Avenue in Bloomington in 1864. This photo was taken at the Old Shakopee Road location in about 1900. Oak Grove, however, was always more than a traditional white Presbyterian Church. Many Dakota were permitted to remain with Gideon after the official removal of the Dakota from Minnesota and they became vital members of the new congregation. Agnes was thus able to experience not only the security of being the wife of a pastor but to also continue her work with the Dakota women and girls she had come to love at Traverse des Sioux. Gideon was 43 years old when he and Agnes began their life together. Agnes was 28 and she was now stepmother to seven children and mother to her own remaining three. Twelve people were living in the little house at Oak Grove, but Gideon and Agnes’ family continued to grow. Herman Hine Pond was their first son together, born on October 15, 1855. A daughter, named after Agnes, was born on December 30, 1856, and another boy, named after Gideon, arrived on June 18, 1858. Frank Wilson Pond was born on August 18, 1860, and Dugald Stewart Pond came into the world on July 12 1863. Their youngest child, Scintlila Sexta Pond, known as Tillie, was born on December 16, 1864, when Gideon was 54 years old and Agnes was 39. Agnes was really a remarkable woman, mother to eleven children, step-mother to seven, and single parent for the last 37 years of her life. “His life knew much privation and hardship for his family was large and his income small, and his gifts to his Master’s work often more than he could well afford. His farm, on which he depended for a part of his support, was at that time unproductive, and a man of less ability and energy would have failed. Gideon died on January 20, 1878, at the age of 67 years; Agnes was 52. Most of the children were married by then and establishing their own families but Agnes was still living at home with Gideon’s daughter Jane who was 31 years old when Gideon died. Jane never married. Herman, Agnes and Gideon’s oldest son, was 22. He didn’t marry until September 1889. Gideon, Jr. was also still at home and was 21 years old when Gideon passed. He married in 1886. Frank was 17 at the time of Gideon’s death, Dugald, or Stewart, as he was known was 14 years old and Scintilla, known as Tillee, was 13. The Gideon Pond House as it looked in 1934. Agnes lived for 37 years after Gideon died. 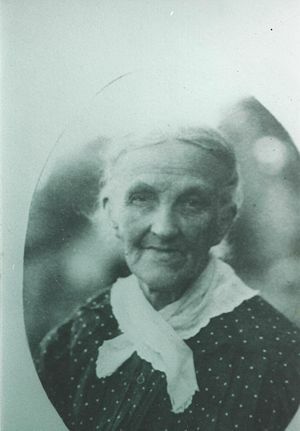 She was 90 years old when she passed away a week before Christmas on December 17, 1915. She is buried alongside Gideon and Sarah in the historic Bloomington Cemetery in Bloomington, Minnesota. All around her are the graves of her step-children, her children and now her grandchildren and great-grandchildren. All, all, are lost to me. I never more can see. Agnes’ and Gideon’s 16 children left a significant legacy in Bloomington, Minnesota, and beyond, while the two oldest served the Dakota mission and the Dakota people for another generation. Agnes’ oldest child, Mary Frances Hopkins, married Gideon’s oldest son, Edward Robert Pond, on July 28, 1864, in Bloomington, Minnesota. Edward had already made a commitment to the Dakota mission by that time and was working at the reservation at Crow Creek by the summer of 1863. After they married, Edward and Mary Frances went to Niobrara, Nebraska, where they worked with John Poage Williamson until the spring of 1870. 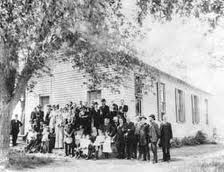 They returned to Bloomington and Edward taught a Sunday School class at the Oak Grove Presbyterian Church for Dakota adults while Mary Frances taught the Dakota children in the Sunday School until 1891. They had eight children. Their third daughter, Fanny Wilson Pond (1869-1948) married Thomas Cornelius Williamson, the son of John Poage Williamson. Thomas and Fanny Williamson also had eight children. Their son, George (1910-1975) married Emma Krahn, and George and Emma’s son, Jeff Williamson, Agnes’ great-great-grandson, is one of the officers of the Pond Dakota Heritage Society, a non-profit agency that promotes the history, preservation and heritage of the Pond Mission site in Bloomington, Minnesota. Agnes’ oldest son, William Hopkins, married Charlotte Harrison on September 7, 1870, and lived in Bloomington. Agnes’ other surviving daughter, Sadie Hopkins, married Harleigh Saige Parker on July 27, 1872, and settled in Gilbert, Minnesota. Agnes’ first child with Gideon, Herman Hine Pond, married Elizabeth Radcliffe Humphreys in 1889 and raised his family in Bloomington. Agnes and Gideon’s next child, Agnes Pond, married Joseph McElroy Moir in 1874 and raised eight children near the family’s Bloomington home. Gideon Hollister Pond, Agnes and Gideon’s third child together, married Winifred Goodrich in 1886, and had four children in Bloomington. After Winifred’s death in 1924, he wed Jessie Palmer. Frank Wilson Pond, Agnes and Gideon’s next son, married Muriel Acton in 1901. They had five children and settled in Ontario, Canada. Dugald Stewart Pond, Agnes and Gideon’s youngest son, married Effie Viola Dawes in 1903, and settled in Bloomington. Scintilla “Tillie” Pond, Gideon and Agnes’ youngest child, married Dr. Cyrus Kidd Ritchie in 1888, and raised her family in California. Today Mission Park and the Gideon Pond House are historic properties operated by the City of Bloomington. The house is located at 401 East 104th Street. Signage throughout the park identifies the specific activities that took place at the Mission over the years. You’ll also want to watch for occasions where Sheila Strobel Smith appears as Agnes. She does a marvelous job of telling Agnes’ story and is dressed in totally authentic hand-sewn garments like Agnes would have made and worn. Jay Ludwig, also a professional re-enactor, portrays Gideon Pond and gives tours of the house on a regular basis. They both bring Gideon and Agnes to life in remarkable ways. Pond, Agnes Carson Johnson [Hopkins], A Few Reminiscences of an Old Lady, 1908, Minnesota Biographies Collection, Minnesota Historical Society, P939, (hereafter Reminiscences). Sadie is Sarah Jane Hopkins, born March 23, 1849. Agnes only mentions that the Riggs were along on this trip but she does say it was a large group. 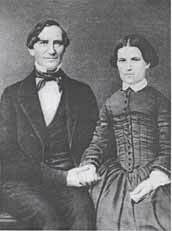 The Riggs had left most of their children in Minnesota with others but 12-year-old Bella and three-year-old Henry accompanied them to Ohio. We do know that Amanda Wilson, aka Sarah Willson, a young woman who had come out to the mission with Agnes and Robert when they returned from their trip home in 1849, was headed back home to her parents in Ohio on this journey. 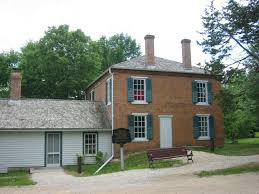 We also know that Samuel and Cordelia Eggleston Pond and their four children took a trip back east at this same time and may have been part of the entourage at least as far as Michigan, when they stopped to visit Cordelia’s brothers who were living there. Pond, Samuel W., Jr., Two Volunteer Missionaries Among the Dakotas or The Story of the Labors of Samuel W. and Gideon H. Pond, Congregational Sunday School and Publishing Society, 1893, pp. 254-455. Jane Williamson to Elizabeth Burgess, July 12, 1853, Dawes Memorial Library, Marietta, Ohio, Item 21, Folder 3.
 http://www.wikitree.com/wiki/Johnson-13001. Agnes Carson Johnson Hopkins Pond family tree on WikiTree. George Pond was born on April 24, 1843 at Fort Snelling, lost his leg when he was 13 years old and then died of cholera in 1866. Pond, Samuel W., Jr., Two Volunteer Missionaries Among the Dakotas or The Story of the Labors of Samuel W. and Gideon H. Pond, Congregational Sunday School and Publishing Society, 1893, pp. 256-257. This entry was posted in Agnes Johnson Hopkins Pond, Cordelia Eggleston Pond, Dakota Mission, Margaret Poage Williamson, Mission Park and Gideon Pond House, Oak Grove Presbyterian Church, Sarah Poage Pond, Traverse des Sioux, Women in Minnesota. Bookmark the permalink.